Try Venison Kabobs On the Grill with Any Vegetable You Can Stab! 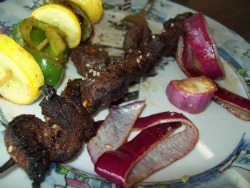 Venison kabobs (elk or deer meat) on the grill can be delicious and tender, if done right. Of course, the recipe below will work great for beef too. (Click here to go directly down to the recipe!) If you don’t have metal skewers the inexpensive wood ones work great. Our family prefers to cut the meat into long, thin strips about the thickness of your finger or thumb, rather than squares or chunks of meat. Four to six inch long strips of meat can soak up the flavor of a good marinade very quickly. The thin strips are then easily threaded onto the skewers several times each and then pushed down to the opposite end to make room for more strips of meat. Since vegetables might take more or less time to cook than the meat (depending on what veggies you use), it makes sense to put them on separate skewers from the meat. I like to serve the venison kabobs off the grill the second each one looks done enough for the individual waiting for it. We like to eat right there by the grill the instant they’re done. Always marinate meat that has been thawed completely for best results. Always let meat of any kind warm up to room temperature right before cooking to shorten cooking time, since it dries while it cooks. Cutting thin strips instead of chunks for the skewers makes it easier to cut across the grain, resulting in short strands of protein. The short strands increase the tenderness of leaner, sometimes tougher wild game meat. If you are starting with a roast for your shish kabob recipes, cut the roast into ½ inch to ¾ inch thin steak shapes. Then cut the steaks into strips for the kabobs. Just make sure one of the cuts is across the grain to assure tenderness. If you prefer chunks of meat on your skewers, cut them about one square inch each and marinate for a couple of hours or more, or put your favorite rub on all sides before placing on the grill. If you want to skewer hard vegetable like potatoes or carrots along with your venison kabobs, cook them to al-dente (not quite done) on the stove or in the oven first. Use your imagination when choosing vegetables for the skewers. The good thing about kabobs on the grill is that everyone can “have it your way”, as long as the cook has the patience for it. It’s a fun opportunity for the grill master to cater to the guests in a way that really doesn’t take that much more time and effort. One of our recent venison kabobsgrill sessions went like this: “OK, who wants their veggies marinated with Italian dressing and who wants them plain? Who wants well done and who wants medium?” One of the artistic younger members of the family volunteered to skewer and grill the vegetables because the variety and freedom to “play with the food” was inviting. He even added green and black olives to the skewers of yellow squash, bell peppers, and mushrooms. We bathed the veggies in Italian dressing in a bowl, and then brushed more dressing on them as they were grilling. The strips of meat for the venison kabobs were marinated in theingredients below for half an hour, or so. A half cup of the marinade was kept aside for basting, so as not to contaminate it with raw meat juices. Always discard your marinade that has had raw meat in it. Don’t be tempted to brush it on while the meat is cooking. You can get away with it if you brush it on your venison kabobs immediately after placing them on the grill, but don’t use that contaminated brush after that! Just get rid of it and use uncontaminated marinade and a clean brush to add more as the meat cooks. It’s important not to overcook lean wild game meat. It gets tougher as you cook it. With these thin strips it doesn’t take long to cook, so make sure your vegetables are ready to eat the same time the venison kabobs are. Start by pre-heating your grill to a high temperature. Then turn down the heat to about half way. Put your venison kabobs on the grill directly over medium flame and close the grill for three minutes or so. Turn them all over and close the grill again for another three minutes. If they aren’t done by then, you can just watch and turn with the lid open for the remaining time until they look like you want them to. How long to cook the vegetable skewers? Until you and your guests like the way they look! You can eat them raw safely, so “doneness” is an individual thing. The softer vegetables don’t take long to get hot and take on that grilled look and flavor. Experiment! Remember there is no exact science to grilling and no wrong way to do it, unless you burn it beyond palatability. (Our dog doesn’t mind!) Just prepare extra meat for a mistake or two, and then make the correction. Besides, any extras leftover from the grill party are always welcome the next day. Here’s one version of Venison Kabobs. The variations are endless! Cut meat into thin strips as described above and put in a bowl with enough marinade to cover it all. Stir and toss to cover each piece with marinade. While the meat strips are marinating pre-heat your grill to about 500 degrees. When you’re ready to grill turn down the flame to medium. If you use coals, spread them out once they get hot to reduce the heat a bit. 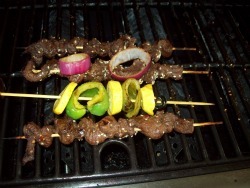 Sprinkle the skewered venison kabobs with sesame seeds right before you put them on the grill. Close the lid and let them cook for about three minutes. Turn them over with meat tongs, marinate with the marinade you set aside and cook for another three minutes or so with the lid closed. Finish the cooking process with the lid open so you can watch it. Occasionally baste venison kabobs with remaining marinade. Serve immediately when done along with the skewered veggies. If you decide to grill your vegetables on separate skewers, put them on the other side of the grill so you can control the heat to match the timing of the doneness of the venison kabobs. Try sliced yellow squash, wedges of green peppers, mushrooms, black olives, and red onions. You might have to lay your onion in rings on top of the cooking skewers, if they won’t stay on the stick. It depends on how you like to cut them. Try bathing the vegetable chunks with Italian seasoning to add some flavor pizzazz. Try any kind of vegetables, even tomatoes! Cherry or grape tomatoes work well on skewers. Experiment with different dressings or dry seasonings. Try grilling some corn in the husks. Pull back the husks and remove the silk, then pull the husks back down over the cob before placing them on the cooler sides of the grill. Any vegetable you can stab with a skewer can go well with your venison kabobs!